"Frost Sisters" Anna Faith and Lexie Grace Carlson. 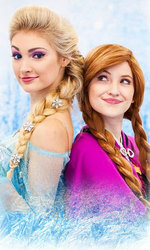 These sisters shot to fame when Anna Faith posed next to an in-store display of Elsa from Frozen and was instantly labeled "The Real Life Elsa." After the picture went viral many times, they have now appeared on Good Morning America, Fox News, TMZ many other TV shows, radio stations and magazines around the world. Anna & Lexie have performed in front of thousands of children all over the world! They often visit sick children in hospitals, schools and have fundraisers for many charitable organizations. With over 1 million followers on social media, you can find them everywhere! You can follow them too on IG "frostsisters" "annafaithxoxo" and "lexiegracelove".